I climbed the stairs to the roof last night, hoping the full moon would be visible in the overcast sky. It wasn’t, but its radiance was. The moon itself could not be seen, but neither could the clouds obscure its fullness. Inspired by the moon’s persistence, I sat down to drink in its soft radiance, hopeful the clouds would part. In India, the full moon is celebrated each month as the fullest, purest, most complete expression of blessing. The full moon in July — Guru Purnima — celebrates the unique blessings of the teacher. Since living in India decades ago, each July, I reflect on the fullness of my teachers’ blessings, and feel how they continue to nourish me. Where would I be — who would I be — without my teachers? Teachers see something in us we don’t yet see. Their vision gives us confidence that with consistent, dedicated effort, we can find our gifts and bring them forth. We hit rocky patches as we strive to express our gifts, and stumble in the darkness more than once. Like the full moon, our teachers’ radiance shines in us even when we feel more defined by our clouds. The teacher’s form passes, but the teacher’s blessings are timeless. They live in our memory, fed by our gratitude. What action can you practice today to thank your teachers by expressing the values they inspired? 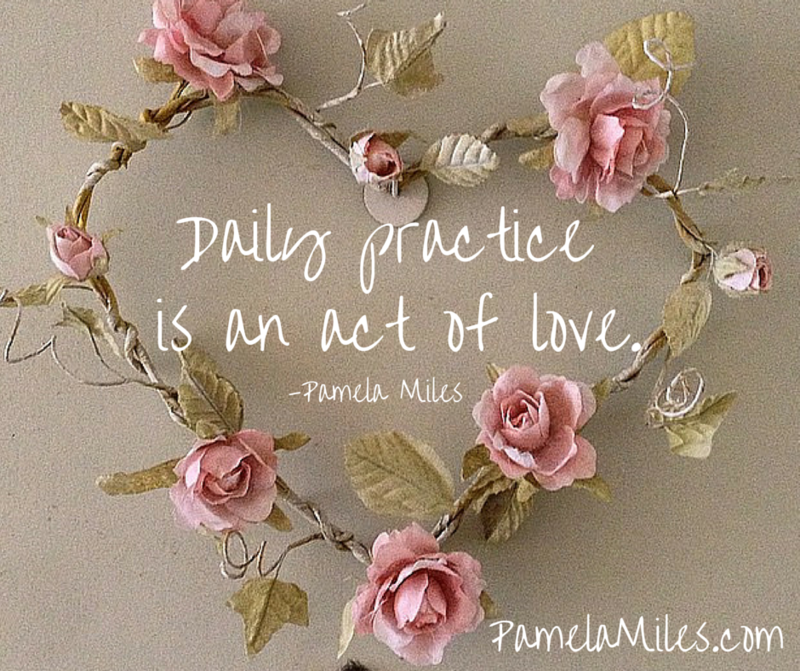 That practice, done every day, is a living memorial to the blessings that sustain you, and all of us. How do your teachers’ blessings continue to support you? Please share in a comment. How many times have you put down the phone and wished you’d said, “No?” Or walked away from a conversation feeling resentful, like you’d just given away the store. It happens so fast, and then it’s really hard to take back. When someone around you is angry, do you pick up their agitation and carry it with you? When a friend needs support, do you listen and comfort, or do you feel the need to fix? Imagine the difference it would make if you could stay steady, if you didn’t get intimidated or sucked into people’s emotional states, if you could graciously hold your own when someone puts the pressure on, provokes a confrontation, or is emotional. Those Boundary Moments are where the rubber hits the road, where we make choices that support us, or sink us. Our skill with boundaries — or lack of it — affects every part of our lives. I know you can do better. And it’s really not so hard. At least not once you find the right help. Can you really learn boundaries? If you were more skillful with boundaries, you would feel more in control of your time, and your life. How does that sound? For years, I’ve taught a transformational boundary class, Spiritual Self Protection, here in New York City, including at the NY Open Center (and one winter in San Juan!). Attendees have been astounded by the results. Even I was astounded by the results. And I was moved by the need. People around the world asked to be included. “Is there a recording?” they’d say. But the class wasn’t an event we could record. I wanted to help — I truly did — but how? I’m a recovering perfectionist, and it took a bit of time to develop an online format I felt good about, one that I knew would really work for you. Not hours of videos you buy and never watch, but an interactive format that accommodates itself to what your days and nights are really like, and brings transformation home to you. I mean literally in your own home, on your own schedule. And finally, I’ve done it, and it’s road-tested. For the past year, I’ve led online programs that have been life-changing for many. Now I’m using that format to offer a boundaries program. In BETTER BOUNDARIES, you’ll learn heart-writing, a simple practice I’ve developed and can’t wait to share. Heart-writing offers you a gentle yet profound path to knowing and loving yourself more fully, so you naturally develop clear, compassionate boundaries. And the best news is that it’s easy to learn, and easy to practice, even with a busy schedule. Please join me for this transformative program. BETTER BOUNDARIES starts Friday, January 26. Not the obvious — sitting for meditation, getting on your yoga mat, or placing hands for self Reiki (to mention my favorites). What is your hidden practice, your mind’s default, what your mind does when you aren’t telling it what to do (as in most of the time)? Every mind has a practice, a habit it defaults to. Your mind is no different. What does your mind practice when left on its own? Does your mind practice gratitude or self-love? Or does it practice some variation of self-doubt or self-criticism? A conscious daily practice — one you choose and continue choosing each day — changes your mind’s default so when the going gets tough — as it does at times — your mind supports you instead of digging you in deeper. Is there a practice you enjoy but practice sporadically? Can you restructure your practice — and your expectations — so you actually practice every day? What amount of time could you commit to comfortably? Twenty minutes? Ten? Five? Two? One? Even a minute of practice consistently each day is enough to transform your life. It’s easiest to be consistent if you choose a time of your day to practice — as you arise or go to bed, before you eat, etc. You might need some support to start that habit, but soon you’ll enjoy your daily respite so much that you’ll look forward to it, and rely on its support. Yes, the effort you can make is enough to transform your life. As long as you keep making it. That’s when it becomes a practice. Choose a practice you feel excited about. Now is a good time. Otherwise, it becomes one more thing you have to do. If you don’t have a practice, here’s one anyone can do: breathe. Breathing is the easiest practice because your body already practices it. All you need to do is pay attention to a few breaths. Pay attention, as in enjoying a few breaths. Not changing your breath, but rather keeping the company of your breath. If you already have a consistent daily practice, would you like to refresh it? Here’s an idea: as you start your practice each day, think of one thing you are grateful for. It can be a very small thing. There will be days when a tiny bit of gratitude is huge. The secret to continuing practice is motivation. If you practice defensively — because you want to change or be better or stop talking so much or whatever — you will run out of steam. But if you practice from gratitude and self-love — simply because you are grateful to be, and this is the person you get to be now — your gratitude and self-love will continually refresh your practice. And your practice will continually refresh you. Why not love yourself now? If you don’t love yourself, who will? Then let your enthusiasm to take good care of yourself — for your own sake and the sake of those you love and those you don’t even know — carry you forward through this Year of Practice. Please tell us what practice you choose in a comment below. Then let’s support one another by sharing our #yearofpractice generously, inviting others to join us. What goodness might we manifest in the world this year with our daily practice? Who would argue? Who doesn’t know someone struggling to manage the details? Maybe you are that someone. Take heart: challenging times are ripe for practice. The support created by spiritual practice is never more palpable than in challenging times. Whatever your chosen practice — meditation, yoga, Reiki, prayer, awareness of the breath, etc. — hold to it now. Be consistent in your effort, even when your effort seems absurdly unequal to the challenges at hand. If you are steadfast in your practice, it will keep your heart tender, steady, and clear. Steady practice gives perspective, revealing details and context together in a balanced whole. Steady practice enables you to sense the timeliness of your participation. It opens the ease to wait when it’s time to wait, and act when it’s time to act, without conflict. When there is conflict, steady practice helps you recognize that conflict is within the person feeling it, and enables you to explore your inner battlefield, transform your understanding, and heal even festering wounds. The healing and steadiness you create in your own life is your much needed offering to the world. In challenging times, the foolish forsake practice, dooming themselves to foolishness without end, while the wise cling to practice. It took me a while to recognize what he was feeling. Children tend to know what they want. As we age, desire becomes more complicated. Eventually I too tasted the restlessness of desire without direction. If you are older than thirteen, you know the feeling. A yen for something, anything. Except, of course, anything you have. It’s easy to feel the discomfort of this restless desire, but what if you paused to look again? Why not sit and explore desire? If you have a spiritual practice, use it. If you don’t, simply breathe and observe. Stay open and aware, and you’ll be surprised by what you discover. At the core of desire lies a sweet longing, your heart aching to be, to simply be. Since you already are being — you already are what you desire — you can rest in this longing and let it enliven your experience of yourself. No longer restless. Now scintillating. At this time of year, instead of getting carried away by desire, letting it whip you into expectation and disappointment until you are exhausted and brittle, why not unmask and enjoy longing for what it really is, an expression of your joy of being? Joy, the gift that truly keeps on giving. A client came for her second healing session yesterday. She enthused about having had the best sleep of her life the night after her first session. Which was 20 years ago. She looks much the same as she did then; I would easily recognize her on the street. She’s a smart, sensible, accomplished professional woman, a wife and the mother of two adult children in a close knit family. She’s involved in her community. She’s engaging company, and a good person. The family seems financially secure. Clearly she’s made a lot of good choices in her life. And then there’s the sleep thing. If something gave you the best sleep of your life, and it was legal, and you could afford it, would you wait 20 years to repeat? It’s easy to say, “Of course not.” But I wonder. I wonder how many good things I haven’t followed up on for who knows why. What about you? What goodness lies waiting for you to bring it into your life? And what are you going to do about it?